When choosing patterns, try to ignore the fabrics and colors used in the pictures or drawings on the envelope. Focus on the overall design of the items. Look at the shape of the pieces, the location of seams and how the pieces are put together. The line art can be especially helpful. Looking at Simplicity 2449 view A, you might be put off by the turquoise and rattan. But remember that you get to choose your fabrics and colors! 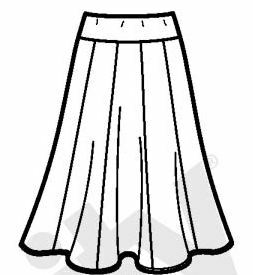 If you look at the line art, you can see how the skirt is put together - it's multiple panels making a flared skirt. There is even an option to bustle up the skirt. By using gothy fabric(s), you can create a skirt that barely resembles the pattern envelope's photo but is identical in construction. Line art shows the construction of the skirt. 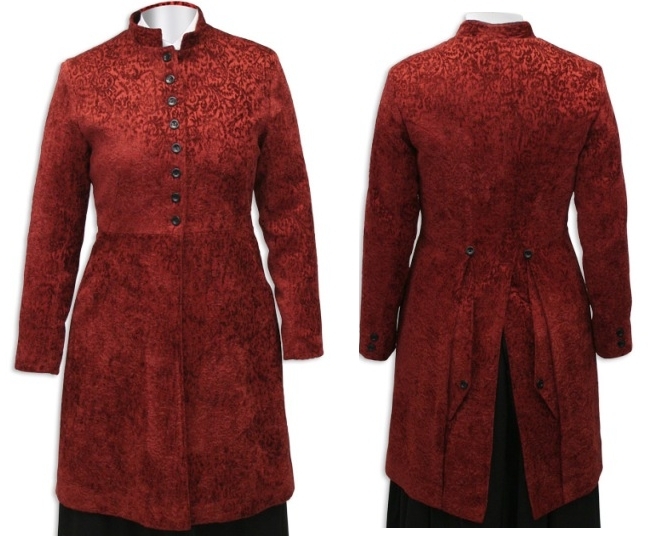 Let’s say you love Lip Service’s Devil Dolls III Starlight Rocker dress but can’t find it in your size. (In my experience, if you're bigger than a size 6, you're usually out of luck with Lip Service.) Check out McCall’s 5094. At first glance, it’s a cacophony of pastels and florals. But look at the lines and you’ll see that the basic shape of view A isn’t entirely unlike the rocker dress. Sewn in black fabric, with ribbon trim added over the bust and waist seams, and worn with a tulle petticoat peeking out, it would be very similar. So breezy! So pastel! So not goth! the fantastic Lip Service dress. 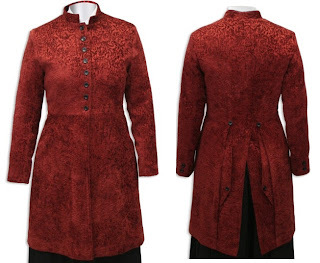 Let's say you love the style of WahMaker's Victorian frock coat but you want it in purple. Alas, it is not offered in purple. 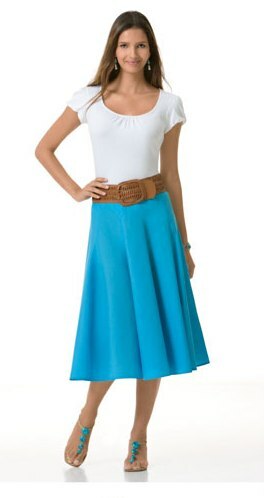 Look at Butterick 4929. The shape of view B is similar. My problem isn't following the lines- it's the "well, I can just alter X, Y, and Z..... and then I've wound up making it more difficult than simply drafting a pattern from scratch. On a related note, I should post pix of my altered vintage-style apron. Inverted scallops look an awful lot like batwings. For the record, inverting a scallop is damned difficult. Would love to see the apron. Scallops (and inverted scallops) do indeed require precision with the many curved seams and points. Nice tip. I really want to loose weight so I can sew lovely clothes. It's not fun to sew tent like dresses. Its so annoying because Ive always been "normal sized" until this last year. I'm tall too, I always have to alter any pattern I'm using anyway, so I took a costuming class at the local CC to get a foundation of how garments are constructed. It's all pretty intuitive, although I've seen some patterns that are just convoluted. It's as if the pattern designer uses a different sort of geometry than the rest of us. Pics of the apron over on my lil corner of the interweb. I love your blog! It's the best and so inspirational!